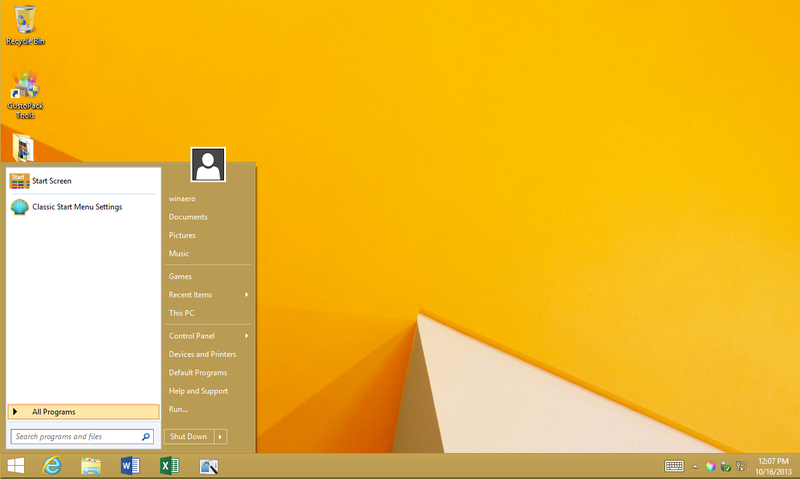 For those who are using Windows 8.1 RTM, you will find that the taskbar color has been tweaked by Microsoft AGAIN and therefore the Start Menu skins shipping in Classic Shell no longer match the taskbar color. Moreover, the taskbar is now MORE transparent than ever, it's so transparent in fact that if we have the same level of transparency for the Start Menu (like other Start Menu replacements do), then the Start Menu's glass column gets unreadable because the glass in Windows 8 isn't really Aero Glass - it has no blur and other effects. So I prepared a modded skin which tries to preserve readability of the glass and still tries to match the taskbar color (it's not an exact color match yet if you use transparent menu but somewhat close, it's slightly darker to preserve readability ). If you make the taskbar+Start Menu opaque, then it's an exact match. Download the skin here: Winaero Skin 2.0 for Classic Shell (the installer will set all values automatically depending on whether you choose opaque or transparent glass Start Menu+taskbar). 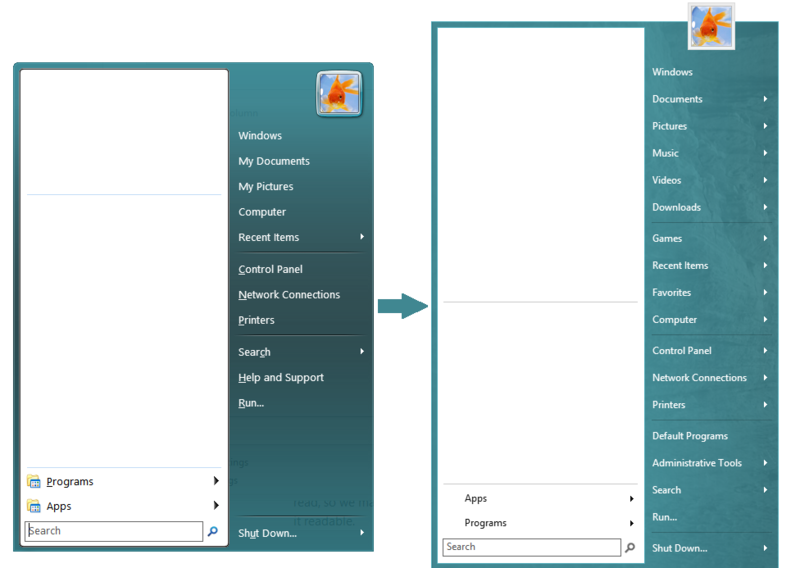 Note this is a skin with .skin7 extension (Windows 7 style of the menu only). Read here if you are interested in knowing why you need to adjust these values: http://www.classicshell.net/forum/viewtopic.php?t=1186&p=6210 (in a nutshell, with every release, MS tweaks the Aero appearance so one skin cannot satisfy all the different versions of Windows). And finally, show us your beautiful desktops if you want to in this thread: http://www.classicshell.net/forum/viewtopic.php?f=10&t=1180 We would like to see how well the Start menu matches your taskbar color with this skin. This is how the Winaero Skin 2.0 looks with opaque menu+taskbar. If you are using Windows 8.0, and/or the Classic with two column style of the menu, here is the older 1.0 version of the skin: Winaero Skin 1.0 (for Classic style of the menu (extension is .skin), tested on Windows 8 only). 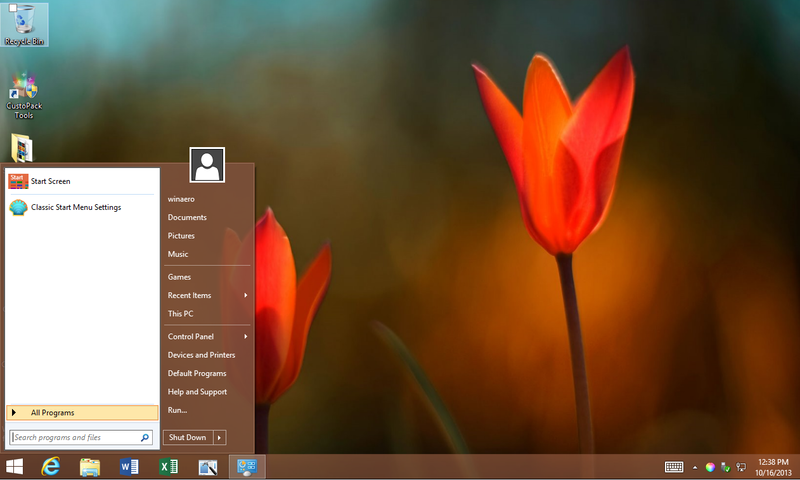 For Windows 8.1, it may not match the color. Back up your settings before installing this as version 1.0 resets some settings. Version 2.0 which is for Windows 7 style doesn't reset settings.